If I may, Airwaves are to be congratulated. There aren't too many companies who would be willing to put hard currency on the undertakings of such madmen as modelers, let alone on subjects relating to the hitherto little-known Soviet VVS. Airwaves boss Andy, however, is made of sterner stuff. And he has been rewarded, I think, with some correction sets that are, really, absolutely masterful. Following on their gorgeous Type 10 nose set, Airwaves have--as promised--now released the Type 5 correction set. This set once more hails from the Design Bureau of Peter Vill and Bob Partridge, again in fine resin, and is intended as before to re-work the Academy/Hobbycraft I-16 kit. This is very well, because the former includes a nice closed canopy for the Type 5, one that hitherto could not be used with the model correctly. As well, it is high time that we had a proper Type 5; I have been frustrated myself that, short of major surgery on a single kit, such a variant was not possible. This is intolerable when one is talking about the most produced model of this aircraft, accounting for more than a quarter of all I-16 production. The Type 5 nose is based upon the wonderful Type 10 resin unit. As such, it shares the same fine characteristics of that part. The nose is a plug which fits snugly into the model's fuselage. This is achieved by cutting away the kit's nose along the major panel line making up the joint between the cowl and wing inner section with the rest of the airframe. As before, the cowling is hollow, it will accept the kit's engine, and the face is a separate piece that mounts onto the front of the cowling unit. There are no intake fairing's on the Type 5 cowling, and the gun blisters from the kit are not needed. The exhaust ports have been reworked to the appropriate 'teardrop' shape of the usual Type 5. The arrangement of the exhaust stacks is unchanged, and identical to the Type 10 nose. The usual Type 5 (i.e. not the late production 1938 standard) featured the original I-16 wings which demonstrate 11 ribs outboard the joint strap. As well, this wing carried the original full length ailerons. Both of these items have been faithfully replicated on the Type 5 wings, which also features corrected leading edge spruce sheeting. In short, they are gorgeous. There was considerable debate during the design process as regards the wing's features. What was the best way to replicate the wing rib detail, it was asked? The actual wing, as with any fabric covered structure, shows scalloping between the ribs (as a result of the taut fabric). In the end, it was decided that replicating this scalloping would require a special piece of machinery, and so ribs were added instead. These ribs, however, were very well conceived, and are beautiful. I have no doubt that they will look very convincing on the finished model. 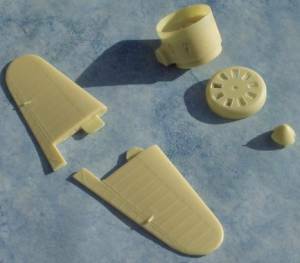 The wings, as shown, are designed to fit onto the kit outboard of the joint strap. This will allow the modeler to make even a very rough cut in the area, discarding the kit wings. A small additional cut will be required to accommodate the larger ailerons. The result should be a great fit, and without any extravagant work to accomplish it. The Type 5 conversion set is a match in every way to the outstanding Type 10 set which preceded it. I have never seen resin better cast that that done by Airwaves, and the accuracy and detail of this set are wonderful. As well, the engineering in this conversion set shows much care, and applying these pieces to the modified kit should present no difficulties to the average modeler. I must again award a rare '100' score for this delightful set. I, for one, cannot wait to see some completed models with this conversion. The Type 5 nose correction set is not yet ready for sale in the shop. This will occur very soon indeed, perhaps even as one reads this article. However, pre-orders can be made to Andy via the Airwaves web site, or following the e-mail link above.